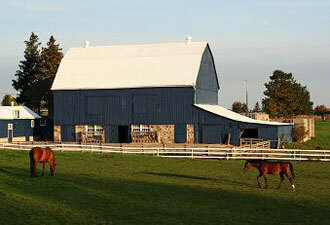 Horse barns come in a wide variety of sizes, styles and colors. If you are shopping for one, you will find that you have many choices. The barn design that you end up with will generally be determined by the space available on your property, the size of your herd, and your available budget. Horse barns are wonderful protection for your horses, but before making that sizable purchase, there are a few things to consider. Get the best fence to go with it! Give us a call for all the options: 877-306-4024. Really, the first decision you have to make will be whether you want to buy a pre-fabricated barn (meaning all of the pieces are created in the factory and shipped to you for assembly) or hire a contractor to build a barn from the ground up on your property. Pre-fab horse barns are less expensive, but require some work on your part. Of course, you can hire the contractor to assemble your barn as well. One advantage of pre-fabricated equine barns is that they are usually non-flammable. This means that they are not only very safe, but insuring them is generally less expensive than a traditional wood barn. Construction material – Traditional barn construction normally calls for wood as the primary material, and this continues to be popular. However, wood must be pressure treated. The biggest reason for this is so that the wood does not rot. In addition, horses will tend to chew on untreated wood – something you want to avoid if possible! Size – The size of the horse barn will be determined mostly by how many horses you have (or how many you plan to have, once you have a barn for them). Figure each individual stall to have 144 square feet (12 by 12) so that each horse has enough room to move a little. You will need a stall for each horse, plus storage space. Ventilation and insulation – These things are important for the comfort of your horses. Since most horse barns are not air conditioned, you need to do everything you can to make sure the horse’s area is as cool as possible in the heat of summertime. In the winter, proper insulation will help retain much of the heat. Storage capacity – Remember, there needs to be space in the barn for more than just your horses. Hay, bags of feed, and tack all require a place to be kept, and the barn is the natural place. Some horse owners just set aside one of the stalls for storage, since there is usually adequate space and it allows for easy access. Sturdiness – Horse barns must be built strong and solid. If a horse gets spooked or agitated, you don’t want it to be able to run through a wall. Horses can pack a lot of strength, so make sure your barn is sturdy. Don’t get a barn without getting the best fencing! We can help with that – call us today at 877-306-4024. Finally, you want to make sure you get the best quality horse fencing to protect your herd when they are not in the barn. Horse barns include a lot of things, but they don’t include the fencing you will need. That’s where we come in. We have the highest quality steel board and aluminum fence products available – and they look fantastic as well. No maintenance, and no worries about a horse getting past the fence or getting injured because of a broken fence. Give us a call to get all the details about what we have to offer – you will be delighted!